Are you looking for the Best Search software for Windows? Whether you have organized the files in your computer or they are all over in the hard drive, a great search utility software will get you the right file in lightning fast speed. 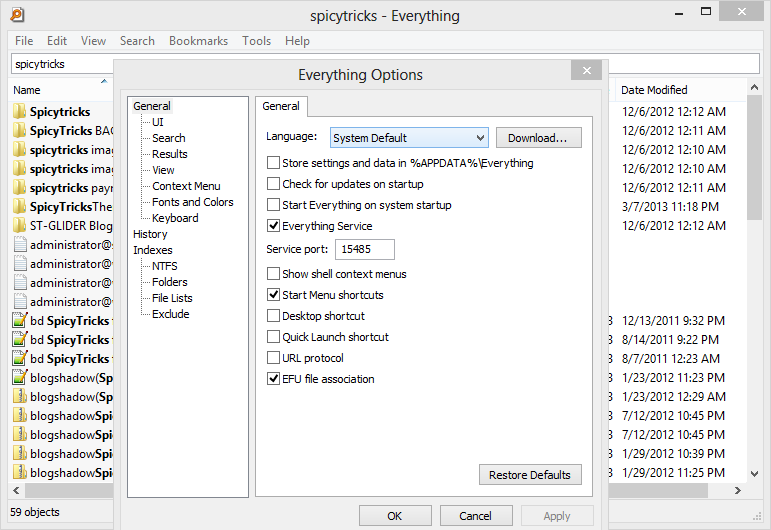 Everything , a windows search tool, is the one of the most popular search utility. I personally used this search tool over the last few years, and it works like charm and will get you the file you are searching in no time. Everything was released in back in 2008 and become the one of the popular search tool. This search Utility will index all the files in your computer in its own database. When you type the name of any file, it will show that file quickly in a few keystrokes. But this software can’t find the huge files that eating up hard drive space and also that is not job of this software too. Like the other search tools, it won’t search the contents of the file, it will do your search in a perfect way. For the best results, open the search tool and leave it windows. Everything was stopped the development in late 2009 and updated again this year. The last version works in all Windows operating system without any problems. While you open the everything tool, it needs the admin access to search efficiently in your PC.